The inquiry has issued an update on a number of areas as it prepares to begin hearings on 21 May 2018. Phase 2 will address the remainder of the issues identified in the List of Issues which was published on the Inquiry’s website on 14 September 2017. There will be no hearings in the week commencing 11 June 2018 and also no hearings from 3 August 2018 to 3 September 2018. Following the end of the oral evidence there will be a break of 10 days or so, following which the hearings will resume on 29 October 2018 with closing oral statements for Phase 1. The Chairman will prepare an interim report following the end of the Phase 1 oral evidence hearings. The programme for Phase 2 hearings will be issued nearer the time. 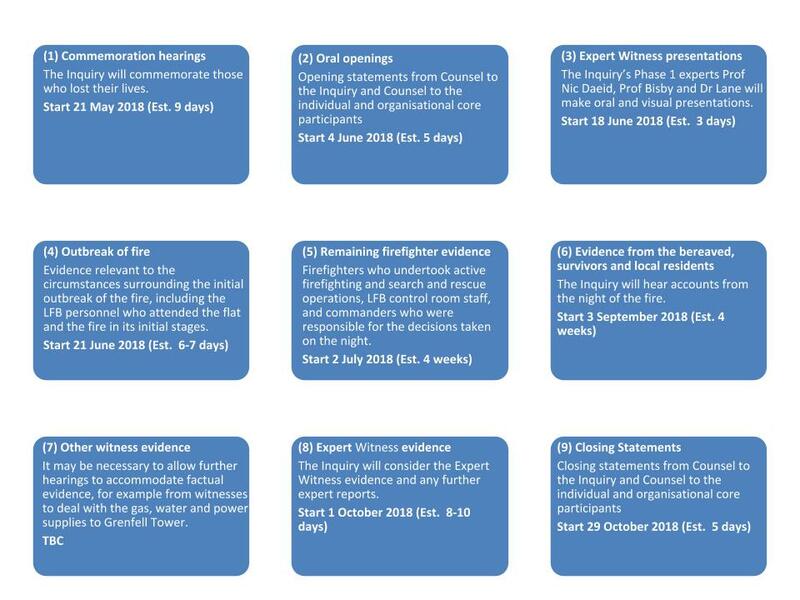 Phase 1 of the Inquiry hearings will begin on Monday 21 May 2018 with commemorations of the lives of those who died in the fire at Grenfell Tower. The commemorations will be by the families and friends of those who lost their lives and will be held at the Millennium Gloucester Hotel & Conference Centre, 4-18 Harrington Gardens, London SW7 4LH. Following the commemoration, Phase 1 hearings will continue at Holborn Bars from 4 June 2018. The Inquiry currently has 547 core participants made up of 519 individuals and 28 organisations. The Inquiry plans to update the published list of core participants on a monthly basis. The latest update is available here.